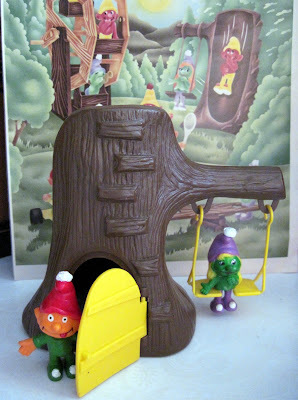 Tracy's Toys (and Some Other Stuff): Green, Yellow, and Orange Smurfs? No, They're Empire Gnomes! Green, Yellow, and Orange Smurfs? No, They're Empire Gnomes! Smurf collectors, in their pursuit of rare variations of the little blue figurines, sometimes come across what appear to be anomalies: Smurf-like characters in odd shades of green, yellow, and orange. For quite awhile, confusion reigned in toyland over these items: they were pretty clearly Smurf knock-offs, but what were they? I had no clue, but I knew I liked them. Finally, I somehow chanced across a vintage ad in an old monster movie magazine, and there they were, but with a name: The Gnome Family, made by an American company called Empire in the 1970s. 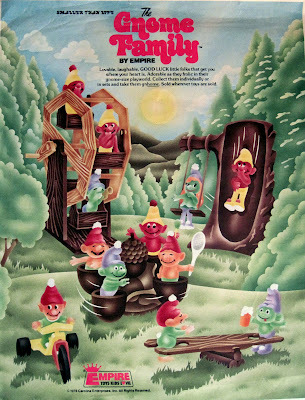 The ad, copyrighted 1978, reads: "Lovable, laughable GOOD LUCK little folks that get you where your heart is. Adorable as they frolic in their gnome-sized playworld. Collect them individually or in sets and take them gnhome. Sold wherever toys are sold." "Take them gnhome"...hee hee...anyway, Empire Gnomes have lately become rather popular collectibles in their own right, and snippets of information about them have begun to appear online. 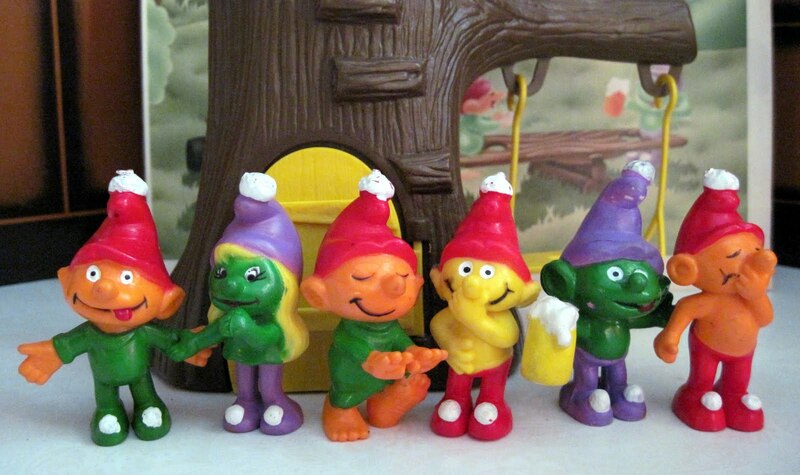 The vinyl figurines are the same size as vintage Smurfs, about 2 1/2 inches tall, but they lack the tiny little "button" tail. (Maybe Empire thought that would be enough to avoid a copyright lawsuit.) 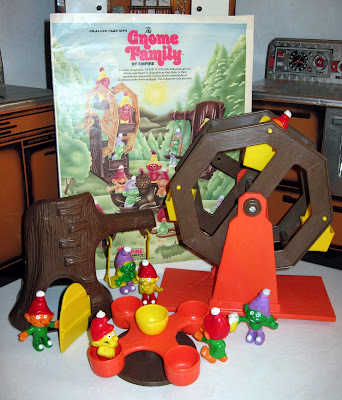 Their accessories are made from a rather cheap, brittle plastic, unlike the high quality European vinyl of the Smurf sets. 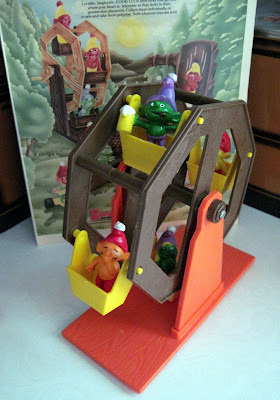 While the gnomes turn up from time to time, the playset pieces are much more scarce, probably because of this fragility. The playground set included a ferris wheel (9 inches tall), a merry go round, and a treehouse with a swing and a slide on the back. 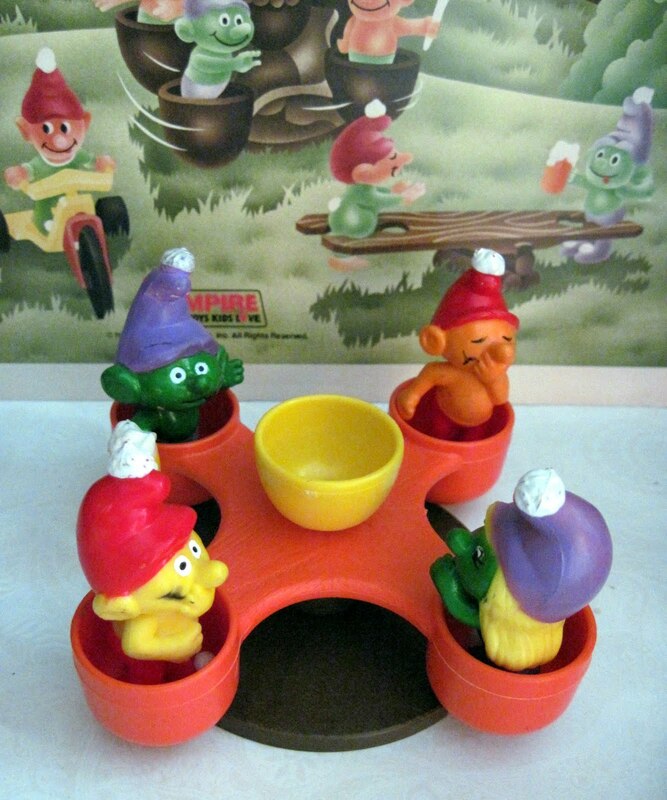 The little guys with their hands over their mouths are meant to look like they're giggling (a clear infringement on Jokey Smurf), but placed in the whirling merry go round, it rather appears they're about to vomit instead, doesn't it? Crazy Eyes Gnome welcomes you to his treehouse. I have the alcoholic gnome in orange! We laugh about how inappropriate it would be if it were made today. One more interesting note: The imprints on the bottom of the feet indicate it was made in 1978 in Hong Kong. That was before the city transferred from the United Kingdom to China. Nothing manufactured today would say "Hong Kong" on it. It would just say "China."